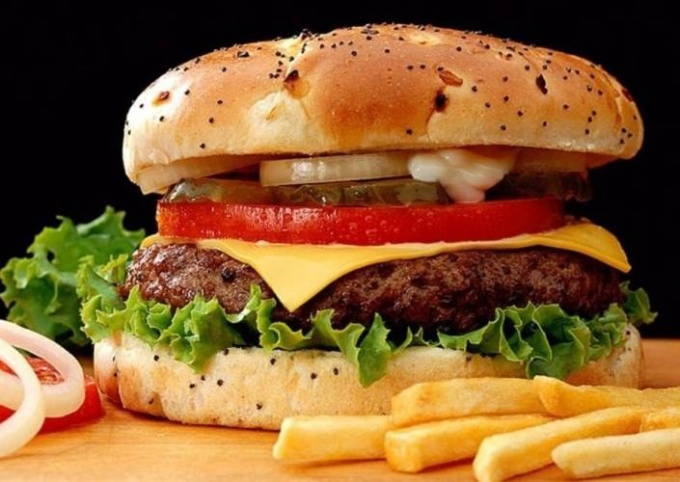 The first hamburger was sold in the United States more than two centuries ago. Since then, he has conquered all continents, but Europe is still associated with the so-called "fast" and unhealthy food. Meanwhile, in America, supermarkets are sold chopped cutlets of high quality lean beef for hamburgers homemade. A hamburger cooked at home was not the most unhealthy food. Take a fresh beef fillet, wash, cut into pieces and grind in a meat grinder. Add in breadcrumbs, egg and mix, put the spices, salt and pepper, mix thoroughly again. Moisten hands with cold water, divide the stuffing into equal parts balls, each ball to make round flat cakes with a thickness of two to two and a half centimeters. Heat the pan with a thick bottom and a little vegetable oil and fry the burgers on both sides for eight to ten minutes. Wash the meat, peel the onions, cut them into pieces, add chopped unsalted bacon, mince, minced salt and pepper, add the spices. Form of minced flat cakes in the thickness half or two centimeters, the size of the bun, which will be invested Patty. Fry on high heat in a frying pan with a small amount of vegetable oil (no butter, just lay tortillas on a hot frying pan with a thick bottom, use a thick-walled pan with grid bottom topography) for two to three minutes on each side. Take a fresh beef sirloin and fatty beef, for example, intercostal meat, where meat and fat roughly in half. Chop, mince with a big grating, add minced salt and pepper, stir. Divide the stuffing into five equal parts, make round flat cutlets in the thickness half or two inches, put on parchment paper and refrigerate for two hours. Preheat the oven to 250 ° C, put the chops on the grill, under the grate, place the pan, zastelil his paper (down fat). Put the grill pan in the oven for fifteen to twenty minutes.